The Huawei Honor 4X was launched in October 2014 and featured as a 4G enabled phablet smartphone. The USP of the phone is its 4G support, which again is a little far fetched from the company’s point of vision as 4G is still in its nascent stage of development. So let's see if this phone has the ingredients to succeed in the market. The phone has a traditional design, and it looks like not much thought has been given regarding the phone’s design. A textured pattern has been provided on the back of the phone that provides a distinct look to the phone. The camera with LED flash light is provided at the top left of the back panel while the power button and the volume buttons are provided at the right edge of the phone. The MicroUSB, microphone, and speaker grille port is provided at the bottom of the phone and the 3.5mm audio jack and additional, the microphone has been given at the top of the phone. The phone is heavy, as it weighs 165 grams and so cannot be used for long stretches of time. The Non-removable 3000 mAh battery provided in the phone offers a talk time up to 15 hours in 3G networks. The Huawei Honor 4X features a 5.5 inches LCD capacitive touchscreen that provides a screen resolution of 720 x 1280 pixels. The phone has 267 pixels per inch, thus producing a sharp display. The images and texts produced by the screen are crisp. The viewing angles are not that great, and the colors seem to wash out when the screen is seen from different angles. Also, the screen appears to be dull, even at maximum brightness setting. The display can pose a problem in bright sunlight as the sunlight legibility is not good either. The phone is powered by a Qualcomm Snapdragon chipset clocked to 1.2 GHz Quad-core processor, and 2 GB of RAM. The phone runs on Android OS version 4.4.2 (KitKat), with a planned upgrade to version 6.0 (Marshmallow), with the help of Huawei’s Emotion UI 3.0 skin. The phone comes with an 8 GB internal memory while the memory can be expanded to 32 GB by its users using the MicroSD card slot provided in the phone. The Huawei Honor 4X has a powerful processor that enables its users to have a lag-free Android experience. Videos and games load instantly and work fine, though it was observed little stutter while playing heavy games no stutter was felt while playing heavily encoded videos. The Emotion UI running on the phone has cool features like the Suspend button, which imitates the Assistive touch as seen in Apple’s iOS. One thing to note is that the UI doesn’t feature an app drawer, while the pre-installed apps are kept to bare minimum. The software also incorporates double-tap-to-wake option, which is a nice feature. The 13 MP rear camera provided in the phone is assisted by an LED flashlight while the front shooter is provided with 5MP. HD video recording is done by the camera at frames like 1080p@30fps. Talking about the rear camera, it struggles to focus on objects. On top of the slow focus, the images captured, even in broad daylight, lack consistency. Barrel distortion was observed in some of the images snapped by the camera. Overall, the rear camera has room for improvements. The front camera on the other hand captures some pretty decent selfies. The audio quality of the smartphone when tested with our headphone was nice, but the same can’t be said for the speakers. The loudspeakers seem to crackle at full volume, and the sound gets tinny, too. The Huawei Honor 4X is powered by a non-removable 3000 mAh battery that works decently. By using the various power saving profiles present in the software, you can extend the battery life considerably. The battery provides enough juice to run the phone for one and a half day with moderate to heavy usage per charge. Talking about connectivity options, the phone does support 4G for 2300MHz and 1800MHz frequency bands. The phone does support Bluetooth v4.0, A2DP, Wi-Fi 802.11 b/g/n, Hotspot, Wi-Fi Direct, A-GPS, GLONASS, and FM radio. 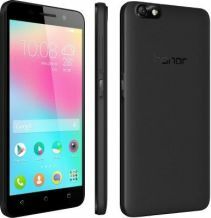 When it comes to discussing Pros and Cons of the phone, it can be said that the Honor 4X offers an amazing battery life, and so this phone can become your perfect travel mate. The Emotion 3.0 UI running on the phone is also a decent feature and offers a range of software tweaks and customization options. If we talk about the negative aspects of the phone, then the first thing to note is the phone’s uninspiring design. The phone looks average in appearance, and much could have been done with its design. The second thing to note is the average camera performance wherein the rear camera disappoints the most.